The Fairbanks-Morse 38 8-1/8 is a diesel engine of the two-stroke, opposed-piston type. It was developed in the 1930s, and is similar in arrangement to a contemporary series of German Junkers aircraft diesels. 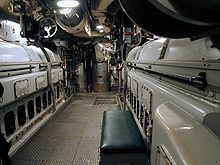 The engine was used extensively in US diesel electric submarines of the 1940s and 1950s, as backup power on most US nuclear submarines, as well as in other marine applications, stationary power generation, and briefly, locomotives. A slightly modified version, the 38ND 8-1/8, continues in service on Los Angeles-, Seawolf-, and Ohio-class nuclear submarines of the US Navy. The 38 8-1/8 has been in continuous production since its development in 1938, and is currently manufactured by Fairbanks-Morse Engine of Beloit, Wisconsin. Fairbanks Morse Opposed Piston liner and water jacket. 38 8-1/8 engines are inline diesel engines, with combustion occurring between two opposed pistons within a single cylinder liner. The engine has a bore of 8 1⁄8 inches (210 mm) and the cylinder height is 38 inches (970 mm). The engine block is of dry block construction. They have been manufactured with between four and twelve cylinders, depending on application. Vertical force is transmitted from the opposed trunk style pistons to either an upper or lower crankshaft. The two crank shafts are geared together by a vertical drive shaft. Pistons are removed by either removing the top crankshaft, and removing from the top, or by removing through the lower crank case access doors. The lower crankshaft is timed 12 degrees before the upper crankshaft in order to expel exhaust gasses prior to the admittance of scavenging air. Fresh air cleanses the cylinders of remaining exhaust prior to the exhaust ports being covered by the rising lower piston. Because the engine is 2-stroke, opposed-piston, the engine features no heads or valves. The two camshafts on the engine provide timing for two injection pumps per cylinder. Porting allows exhaust gases to be expelled and scavenge air to be taken in by a positive air box pressure. Intake air is provided by an engine driven Roots blower or turbo-supercharger. World War II USS Pampanito (SS-383) 38 8-1/8 diesel engines. Historically, the opposed-piston engine was used in U.S. diesel-electric submarines of World War II and the 1950s. Surviving diesel-electric submarines with these engines include USS Pampanito, USS Blueback, and USS Ling. This engine was also used in surface ships, notably in the diesel-electric Wind-class icebreakers and in the geared Edsall-class destroyer escorts. When the innovative but faulty "pancake" engines of the 1950s Tang class proved unworkable, they were replaced with World War II-style Fairbanks-Morse engines, and these remained standard on US diesel-powered submarines through the early 1960s. Variants of the 38 8-1/8 and other Fairbanks-Morse engines provided (and continue to provide) backup power on US nuclear submarines commissioned through the 1990s. During the 1940s and 1950s, Fairbanks-Morse attempted to market their opposed-piston powered line of diesel-electric locomotives, with limited success, leaving the market in 1963. The locomotive market share was eventually dominated by products from GM's Electro-Motive Division (EMD), American Locomotive Company (ALCO), and General Electric Transportation Systems (GE). Certain ice-breaking class vessels of the Canadian Coast Guard used Fairbanks Morse opposed piston engines in the operation of a diesel electric/gas-turbine electric operation. The former CCGS Norman McLeod Rogers, currently sailing under the Chilean flag as Contraalmirante Oscar Viel Toro is one such example. Current marine Opposed-Piston applications include use as main propulsion engines and service generators. The USCG Hamilton-class cutters use the 38 8-1/8 engine in a CODOG arrangement, where the diesel engine provides cruise propulsion, and a gas-turbine provides propulsion where high speeds are required. The Fairbanks Morse Opposed Piston engine is also used as a stationary power generator engine, both in primary and standby duties. The 38 8-1/8 was reverse-engineered in the USSR and used as a primary engine for railroad locomotives. The first Soviet mass-produced diesel locomotive, TE3, was powered by a 1470 kW (2000 hp) 2D100 engine, direct descendant of the marine 38 8-1/8 engine. The TE3 was produced in high numbers (up to 7600 units), and proved to be a reliable mainline freight locomotive. Later this engine evolved to the turbocharged 10D100, rated at 2200 kW (3000 hp). It was used as powerplant for later 2TE10L, 2TE10M, 2TE10U series locomotives. Unfortunately, 10D100 became infamous for its high rate of failures and low operating resource. Currently, plenty of TE10 locomotives remain in service in Russia, Ukraine, Belarus, Lithuania, and Kazakhstan. But during rebuilding program they are often re-engined with more modern and fuel-efficient 4-stroke engines. The 38 8-1/8 has undergone further development to provide for better fuel efficiency and lessen emissions. In the 1990s, Fairbanks-Morse applied their "Enviro Design" technology to run the opposed piston engine as a dual diesel and natural gas engine. This system injects a small 'pilot' amount of diesel fuel to aid in the combustion of natural gas within the combustion chamber while being controlled with computerized electronics. ^ a b c Technical Manual: 1500 KW Diesel Generator Set. Department of the Navy, Naval Ship Systems Command. 1967. ^ Friedman, Norman (1995). U.S. Submarines Through 1945: An Illustrated Design History. Annapolis, Maryland: United States Naval Institute. p. 263. ISBN 1-55750-263-3. ^ Submarine Main Propulsion Diesels. Department of the Navy, NAVPERS. 1946. ^ "Fairbanks-Morse Company Model 38D-8-1/8 Opposed Piston Engine". Tugboat Enthusiasts Society of the Americas. Archived from the original on February 21, 2013. Retrieved April 1, 2012. ^ Pinkpank, Jerry A (1973). The Second Diesel Spotter’s Guide. Kalmbach Books. p. 323. LCCN 66-22894. ^ Silverstone, Paul H (1966). U.S. Warships of World War II. Doubleday and Company. pp. 167–170, 176, 378. ^ Jane’s Fighting Ships of World War II. Crescent Books (Random House). 1998. pp. 287, 288, 290, 308. ISBN 0517-67963-9. ^ "NavSource USS Finback SS-230". Photographic History of the U.S. Navy. NavSource Naval History. Retrieved 2013-03-03. ^ "NavSource USS Edsall DE-129". Photographic History of the U.S. Navy. NavSource Naval History. Retrieved 2013-03-03. ^ "NavSource USS Westwind AGB 6". Photographic History of the U.S. Navy. NavSource Naval History. Retrieved 2013-03-03. ^ Gardiner, Robert (1995). Conway's All the World's Fighting Ships, 1947-1995. Annapolis, Maryland: Naval Institute Press. p. 603. ISBN 1-55750-132-7. ^ "'Norman McLeod Rogers'". Shipping World and Shipbuilder. 3841. 163. January 1970. ^ Steigers, J.A. (2002). "Demonstrating the Use of Fish Oil as Fuel in a Large Stationary Engine". ^ "Enviro-Design | Fairbanks Morse Engine". Fairbanks Morse Engine. Retrieved April 16, 2012. "Fairbanks-Morse 38D8 Diesel Locomotive". PSRM Diesel Locomotives. Retrieved October 25, 2014. This page was last edited on 29 August 2018, at 20:45 (UTC).